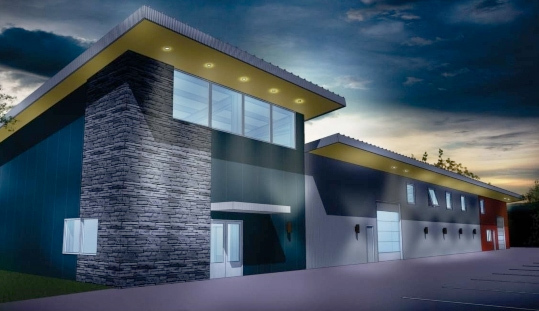 Commercial EcoSteel Prefab Design for a Corporate Office and Distribution center in Whitefish, MT.The modular based, Ultra energy efficient roof system is designed with a metal Insulated Panel. The R40 rating and standing seam commercial roof will provide decades of mainenance free operation in Montana's extreme winter environment. The wall system is a steel frame commercial grade structure with pre-insulated metal panels order in custom colors and corrugation patterns. The Modern Prefab steel building incorporates stacked stone accents which are a requirement from a local code dictating the use of natural materials on the exterior. This detail is achieved easily with our panelized system. The rectilinear shaped of the building and clear-span bolted frame construction provide a flexible interior space for future expansion or adaptive re-use. A Solar Panel Covered Parking structure will provide enough power to light the building and parking areas with surplus energy to store in battery banks for later use. The sustainable energy systems, recycled steel content, Pre-Cut components and ultra efficient insulated roof and wall panels create a State Of The Art building system. LEED Certification of up to a Platinum Level with proven commercial grade components that are easily installed by a certified steel contractor.